Lynn C. Harris has helped countless injury victims and their families in and around Salt Lake City. A skilled personal injury attorney, he understands that victims and their loved ones need skilled legal representation after car accidents or any cases of negligence that lead to major injuries and hardships. The issue of lanesplitting has come up a fair amount lately online. We'd like to take a moment to go over the basics of lanesplitting and discuss why it's such a dangerous practice. Lanesplitting essentially means that a motorcyclist rides along the dividing line between two adjacent lanes. This may occur when cars are stationary (e.g., stopped at a red light, in heavy traffic) or even while cars are in motion. Lanesplitting is actually illegal in most states, though some states have variations or exceptions on these lanesplitting laws. The only state in which lanesplitting is completely legal is California. The reason that lanesplitting is illegal in most states is because of the many dangers that are posed by lanesplitting. When a motorcyclist rides between lanes, he or she increases the likelihood of a serious injury accident occurring. This is especially true when the lanesplitting is done among moving vehicles. Motorcyclists may veer left or right too much and wind up sideswiping an adjacent vehicle, resulting in major injury (e.g., falling off the motorcycle and being run over). Even when vehicles are stationary, serious accidents may occur. 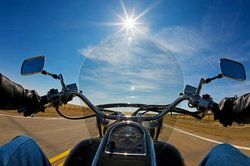 A motorcyclist may strike side mirrors on a vehicle, or the motorcyclist may get doored by a car if a driver or passenger in a vehicle opens their door. When lanesplitting occurs, the motorcyclist isn't the only person at risk, however. Lanesplitting can cause other motorists to have accidents as well. A person in a passenger vehicle may veer left or right to provide a motorcyclist more room, and in the process collide with another vehicle in the next lane or strike a barrier/divider on the road. Multi-vehicle accidents can prove quite serious, resulting in severe injuries or even fatalities. Due to the many risks involved with the practice of lanesplitting, it's important that motorcyclists in the state of Utah avoid doing it. Not only is it against the law, but it can lead to major accidents that put multiple lives at risk. We need to share the road and be responsible in order to look out for each other. If you or a loved one has been injured in a serious auto accident caused by lanesplitting, our team is here for you. We will hold the negligent motorcyclist responsible for his or her actions, making sure that they pay for any medical bills and other losses sustained as part of the accident. We will seek compensatory damages to cover any vehicle damages, medical bills, and lost wages that occurred following the accident. In serious collisions, we will also seek punitive damages to punish the motorcyclist for negligence and address the hardships that go beyond any actual material loss. For more information about your legal options following a serious auto accident, it's important that you contact a skilled personal injury lawyer as soon as possible. Legal expert Lynn C. Harris will help you and your loved ones through the litigation process, allowing you to receive just compensation and peace of mind.